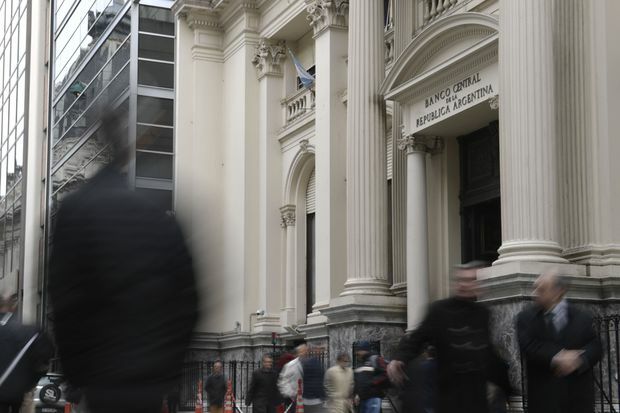 The Argentine central bank announced on Aug. 30, 2018, it has raised its benchmark interest rate from 45 per cent to 60 per cent in a bid to arrest a slide in the value of its currency, the peso. Argentina’s peso lost as much as nearly one-fifth of its value on Thursday despite the central bank’s hiking its benchmark interest rate to a dizzying 60 per cent as investors panicked over President Mauricio Macri’s handling of an economic crisis. After the market close, Treasury Minister Nicolas Dujovne pledged to announce a set of new economic measures on Monday, and will target a fiscal deficit for 2019 that is lower than the current target of 1.3 per cent of gross domestic product in order to reduce the government’s need to go to debt markets. In an effort to stem a slide in the peso, the world’s worst-performing currency this year, and to curb inflation running at 31 per cent, the central bank’s monetary policy committee at an emergency meeting on Thursday voted unanimously to raise its benchmark rate to 60 per cent from 45 per cent. The surprise move, however, failed to stabilize the peso. It finished down 13.12 per cent at a record closing low of 39.25 pesos per U.S. dollar, after touching 42 pesos earlier in the day. The market turmoil erupted early on Wednesday after Macri said he had reached a deal with the International Monetary Fund to accelerate disbursement of a $50-billion loan program agreed in June, in a misguided attempt to calm investor nerves. Instead, Macri’s admission that there was a “lack of confidence in the markets” about Argentina’s ability to finance its deficit next year sowed panic among investors. The country has $24.9-billion in peso– and foreign currency-denominated debt payments next year. The central bank auctioned $330-million on Thursday, bringing this week’s interventions to more than $1-billion. In efforts to prop up the currency the bank has sold more than $13.5-billion this year, leaving it with $54.3-billion in foreign currency reserves. “We are convinced that these exchange rate levels exaggerate the fundamentals of the Argentine economy,” Dujovne said, adding that the country would still be “competitive” with a stronger peso. The MerVal stock market closed up 5.2 per cent, led by export-focused companies that benefit from a weaker currency. Despite the deal with the IMF, which had calmed financial markets briefly after it was announced in June, Macri has struggled to convince investors he can restore economic growth while cutting Argentina’s budget deficit, reducing inflation and making the $640-billion economy more competitive. Argentina has already agreed with the IMF to cut its fiscal deficit from 3.7 per cent of gross domestic product last year to 2.7 per cent in 2018 and 1.3 per cent in 2019.